Hearing Solution Center is an independent audiology and hearing aid practice. We provide comprehensive, personalized hearing healthcare to people of all ages and walks of life. When you have concerns about your hearing, or tinnitus, you should come to place that reminds you of all the reasons you fell in love with Charlotte: a friendly atmosphere, welcoming staff members, and the kind of personalized care we think should be the industry standard, yet is found all too rarely. Here at Hearing Solution Center, we are proud and privileged to serve the people of Charlotte. Research has shown how improved hearing is clearly associated with an improved quality of life- positively impacting your personal, social, professional and physical well-being. When you make the decision to better your hearing, coming to an independent audiologist over a franchise or big box store has its benefits. At Hearing Solution Center we will never try to push you towards a particular hearing device because it’s the only model or brand that we work with, or rush you through the process of finding the right device for your individual hearing loss. We work with a wide range of manufacturers to bring you the latest advances in hearing aid technology at a price that you can afford and that we genuinely consider to be the best option for you. At Hearing Solution Center we take pride in educating our patients and helping them make the best choice for their individual situation. A hearing loss does not have to force you or your loved one into silence and isolation. 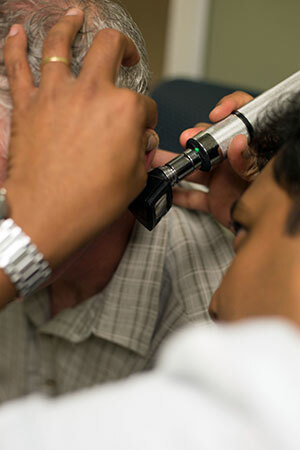 If you or a loved one has difficulty hearing, call now and let our doctors of audiology help. To schedule your appointment, call us today at (704) 912-4422 or fill out our Online Form.